Rebecca Minkoff leather blazer (I love this one too), See You Soon fringe tank, Thrifted maxi skirt, Joelle Hawkens Dakota bucket bag, Spike pendant c/o Gold and Gray, Larsson + Jennings watch, ZeroUV sunglasses, Glancy boots c/o Timberland. Shot by Isaac Lacey. When it comes to fashion, I always try to get the most out of what I have. I still own a bunch of jackets, jeans and other wardrobe staples from as far back as college, and when I feel it's time for me to part with an item of clothing, in lieu of throwing it away I opt instead to give it to a friend, sell it at Buffalo Exchange, or donate it to Good Will. The fashion industry is already so wasteful, so I think it's important we all do our part. Needless to say, I'm all about finding ways to style your clothes throughout the changing seasons instead of shoving them in storage or letting them rot in the back of your closet. 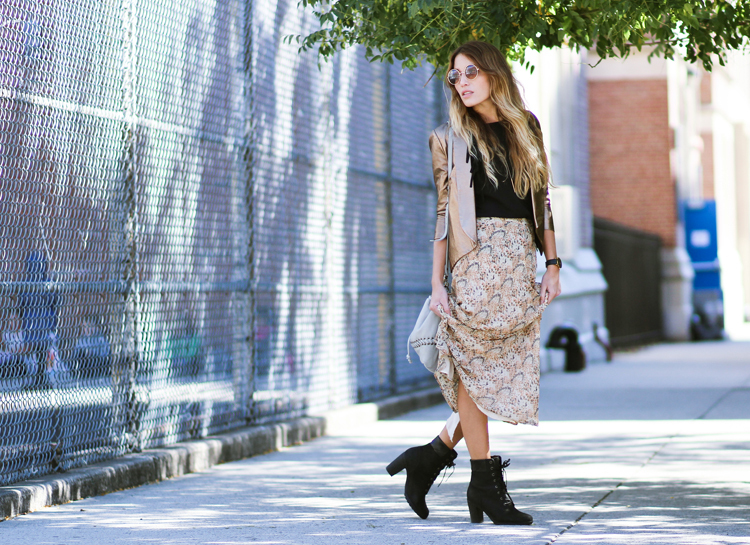 This maxi skirt is one of those items I just recently 'rediscovered.' The pattern, color and sheer layers were perfect for warmer temps (here's an example of how I styled it previously), but when paired with a statement leather jacket and this season's rugged boot, the skirt works surprisingly well for Fall as well. Just a lil reminder to keep an open mind and get creative with your wardrobe every now and then. You never know what might result! Wow love that skirt with the gold moto jacket, so cool!